Neo-Pure HMB-45098-05 9-7/8" Meltblown 5 mic. 100% polypropylene filters offer economical and efficient filtration for commercial and industrial liquid applications. Ideal applications range from, SDI (service deionization) systems, and CDI (continuous deionization) systems, to reverse osmosis systems. 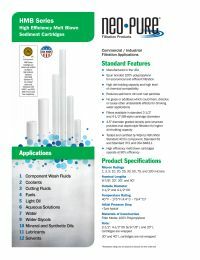 These cartridges are manufactured in the USA with high efficiency polypropylene ensuring reduction of sediment, dirt, and rust particles. Neo-Pure HMB-45098-05 filters are listed for food contact applications in Title 21 of the U.S. Code of Federal Regulations.